Missouri State Counties and one independent city, St. Louis. 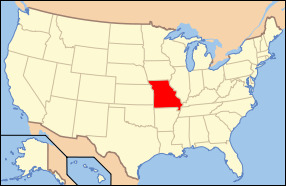 The state of Missouri is located in the region of the Midwestern U.S. And is bordered by the states of Iowa, Kentucky, Tennessee, Illinois, Oklahoma, Arkansas, Kansas, and Nebraska. The state is the 21st ranked most extensive state with a total land area of 69,704 square miles and is the 18th most populated state with a population of 6.01 million as of 2011. The capital of Missouri is Jefferson city, however its most popular city is St. Louis and its largest city is Kansas City. The land where Missouri currently sits was first acquired through the Louisiana Purchase from France, and the land later became recognized as the Missouri Territory and joined the union as the 24th state in August of 1821. Missouri parallels the nations overall demographics in terms of political and economic makeup with a wide variety of rural and urban cultures. The geography of the state varies significantly with the northern region sitting in the dissected till plains and the southern region sits in the Ozark Mountains where the Missouri River splits the two. The beginning points of both the famous Oregon Trail and the Pony Express Trail were both located in the state of Missouri. The climate in Missouri is typically considered to be a humid continental climate which consists of cold winters and hot and humid summers. The climate can be considered humid subtropical in the southern regions of the state. The states climate is not affected by mountains or oceans and thus is greatly influenced by the air from the cool arctic along with the hot and humid air from the Gulf of Mexico. The major industries in the state of Missouri are primarily farming (soybeans and corn), zinc and lead mining, cars, aircraft equipment, and beer. The major bodies of water within the state are the Mississippi River, Osage River, Missouri River, Table Rock Lake, Lake of the Ozarks, Lake Wappapello and Clearwater Lake. The highest point of elevation in the state is located at Taum Sauk Mountain and sits at 1,772 feet above sea level. The state was named after an Algonquian Indian word which has the meaning “river of the big canoes”. The state bird is the Bluebird, the state fish is the Channel Catfish, the state flower is the White Hawthorne, and the state tree is the Flowering Dogwood tree. Even though Missouri is completely landlocked and bordered by many different states, it still features a unique array of geographical features and abundant city life giving the state a great mix of both worlds. December 16, 1811, An earthquake near New Madrid, Missouri, changed the course of the Mississippi River.